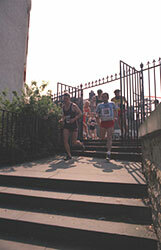 Participants running through the gate at Edinburgh Castle Esplanade. The Concept: Back in the 1970s, there were two fit young guys who went running together in Edinburgh, David Salmond and Alan Lawson. One day DS came across a guide-book to Edinburgh which used the phrase 'seven hills', so they investigated the possibility of creating a route which included them all. After some adjustments, the current route was fixed upon. The Beginning: The event was first staged in 1980, as part of a political/cultural festival on Calton Hill, in support of the Scottish self-government movement; the Seven Hills race was included as a sporting adjunct to the other activities. About 75 people took part in that first year. Expanding: It was soon recognised that the route was something a bit special compared to other athletic events, as well as being a considerable challenge to complete for anyone who was not a regular runner. So, as the great 1980s upsurge of distance running got under way, The Seven Hills became an annual (stand-alone) event, with an increasing number of participants each year. Regulars: Quite a number of runners have participated on many occasions; a handful have an almost complete record. Website Sponsorship: We are grateful to Learntech, a Scottish e-commerce and e-learning specialist company, who created the basics of this website in 2003. Race Personnel: Of the race's originators, David Salmond died of leukemia in 1994; Alan Lawson continues as the main organiser, helped by many friends and relations who have both run and assisted over the years.